Tens of thousands of people have attended Anzac Day services around the country to commemorate the 96th anniversary of the landing of Australian troops at Anzac Cove. There was standing room only at the National War Memorial in Canberra where between 25,000 and 30,000 people observed a minute's silence. "Ordinary men and women who are prepared to make personal sacrifices for the freedom and quality of life that we enjoy today," he said. In Sydney, at least 5,000 people were at the Martin Place cenotaph for the city's major dawn service, despite heavy showers. The crowd was packed more than 10 people deep around the area reserved for the public at the cenotaph. Major General David Morrison addressed the service, saying Anzac Day is about celebrating as much as it is about remembrance. "Through our assembly we witness both their service and our continuing commitment to this vibrant country that exercises its democracy in such a robust and distinctly Australian way," he said. "In promising to remember them, we affirm the future that they have wanted for us." Afghanistan veteran Warrant Officer Craig Cook told thousands gathered at Melbourne's Shrine of Remembrance that Anzac Day is a time to reflect on the pride and pain of war. "It is not a glorification of war but a day where we remember and honour those that have served and those that are currently serving and in particular those that have given the ultimate gift," he said. Thousands of people also turned out in Brisbane, where boy scouts and girl guides formed a guard of honour as a procession of veterans and their families made their way to Anzac Square in the CBD. In Perth, tens of thousands of people gathered at the War Memorial in Kings Park. Vietnam war veteran Richard Adams says he is amazed by how much the crowd grows each year. "I was quite taken in by just seeing some little kids, two or three years of age ... going along with their dad. [It] sent a little shiver down my back," he said. The dawn service recognises all Australians who have served and died or been injured in wars, conflicts and peacekeeping missions. Thousands of New Zealanders have also gathered for dawn services around their country. Soldiers, dignitaries and the Turkish Ambassador to New Zealand gathered at the Wellington cenotaph for the ceremony. Meanwhile, Prime Minister Julia Gillard is in South Korea to commemorate the 60th anniversary of the Battle of Kapyong and will attend a dawn service in Seoul. She will lay a wreath at the Australian National Korean War Memorial. Some of our teenage yobs should be made to sit In services such as this. Here's a radio tribute I streamed last week about 'Anzac Day' on my radio show. In dedication to the Aussie & NZ Veterans and those serving in the Defence Force overseas. 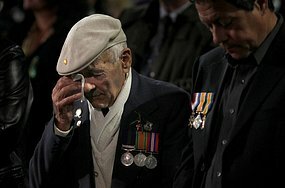 AS Today is Anzac Day(War Veterans Day) and is a public Holiday I would like to pay tribute to the sacrifice of the men and women of the armed forces who particpated in the past wars and conflicts. Some Brief History of Anzac Day? April 25th marks the anniversary of the first major military action fought by Australian and New Zealand forces during the First World War. The Australian and New Zealand forces landed on Gallipoli, Turkey on 25 April, meeting fierce resistance from the Ottoman Turkish defenders. What had been planned as a bold stroke to knock Turkey out of the war quickly became a stalemate, and the campaign dragged on for eight months. At the end of 1915 the allied forces retreated, after both sides had suffered heavy casualties and endured great hardships. Over 8,000 Australian soldiers had been killed. So 25 April soon became the day on which Australians remembered the sacrifice of those who had died in the war. The 25th of April was officially named ANZAC Day in 1916. It was marked by a wide variety of ceremonies and services in Australia. During the 1920s ANZAC Day became established as a national day of remembrance for the 60,000 Australians who had died during the war. In 1927, for the first time every state observed some form of public holiday on ANZAC Day. With the coming of the Second World War, ANZAC Day also served to remember the lives of Australians who died in that war. In coming years the meaning of the day has been further broadened to include Australians killed in all the military operations in which Australia has been involved. Australians recognise 25 April as an occasion of national remembrance, The dawn service -- the time of the original landing -- across the nation. Later in the day, veterans meet to take part in marches throughout Australia. I have marched in a local march on Anzac Day when I was in the Scouts years ago. I come from a long line of military war veterans and personnel my 2 great grandfathers served in World War 1. One of them was killed in action in Battle of the Somme, in 1916(Stepped on a land mine). He had received many medals during World War 1 which were passed to my family a few years ago. My mother marched today in honour of my great grandfather with his medals. I would like to salute those who sacrifice everything for our us here today and I hope an end to all wars which I think will not happen in our lifetime.